2017 is the year Google became convinced its PPC machines are better than you. If you work in PPC and have been keeping up with AdWords changes over the last year or so, you've likely noticed a distinct trend: More control is being taken away from search marketers and put into the hands of the machines. AdWords is increasingly automating decisions we used to make manually, and it's removing limitations on its self-operating bidding machines, or AdWords automatons. For example, a few months ago, Google removed the bidding threshold for enhanced CPC campaigns. Enhanced CPC campaigns have historically allowed Google to automatically bid up or down (up to 30% more than the manually set bid) for queries it determined were either more or less likely to convert. The most recent change removed that threshold so that AdWords could bid however much more it needs to for the conversion. In theory, that approach could be incredibly effective, because Google harnesses its data to improve your conversion figures, but one question comes to mind: How many times will it guess incorrectly before that keyword is no longer profitable? That wasn't the only change. More recently, Google announced it would be more "flexible" with daily budgets, which meant in some instances you'd end up spending more than double the daily budget set. That change was understandably met with some outcry as advertisers feared for their accounts, but as Google released more information, it became apparent that we may have overreacted. The logic behind the change is sound: Allow for daily budgets to fluctuate the same way that traffic does. Regardless of the underlying logic, however, the fear remains: How much more control are we going to be forced to give up? When are the machines going to take over my job? How much better will these campaigns be performing? Will I have to live in complete subservience to the machines once they rise to power? After more than five years working in PPC and analyzing trends in search marketing, I sense that the answers are far less dramatic than the questions. Yes, Google will continue to improve AdWords with tools that help advertisers produce better results with less effort. That doesn't mean we're out of work; it just means our roles as search marketers are shifting beyond routine, repetitive tasks in AdWords; they're evolving into roles that require us to gain a deeper understanding of the marketing and sales funnel. At their core, the advances in automation mean we need to dive deeper into funnel metrics, use multitouch attribution software to get more strategic about PPC investments, and ultimately become the "data-driven marketers" we've always strived to be. Note: If you're working in PPC marketing, I highly recommend tuning into our Pro Webinar series, where we often go over tips and tricks for how to keep up with the increasing automation of PPC and latest advancements in AdWords attribution software. Most of us who work in PPC are familiar with the go-to software offerings: reporting software, bid management tools, landing page software, etc. Over the past few years, product offerings have begun to expand to include deeper interaction metrics and offline conversion data: from call tracking and analytics software that gives you insight into phone calls and text messages driven by search marketing... to user engagement software that tracks visitor sessions and content interactions from paid sources. Moreover, new software that ties actual closed-won revenue figures to our conversions is becoming more and more affordable and easy to implement. Yes, we love watching conversion figures tick up and CPA figures tick down; but, unless we have our PPC data tied to actual dollar figures, we're overlooking a very large piece of the puzzle. Once we have an idea of the actual dollar figures, we can start to assign value not only to AdWords but also to other channels and touchpoints that contributed to a conversion. What role did social media play? How often did a prospective customer click on an organic listing before ultimately converting from a paid ad? When we look at every touchpoint along the customer journey, we have a far better understanding of what leads to a conversion and we can subsequently make far more informed decisions on bidding. Below, I'll go over three PPC tracking software techniques that put your own machines to work, and I'll discuss how they can set you up for elite PPC performance in 2018 and beyond. First up is call tracking/analytics. Many of us have been tracking calls for ages. (If you aren't, you should start.) Tracking both calls from AdWords call extensions and calls as conversions on your site (via dynamic number insertion) are important. Even more important than call attribution, however, is mining the wealth of data you can capture from those calls. 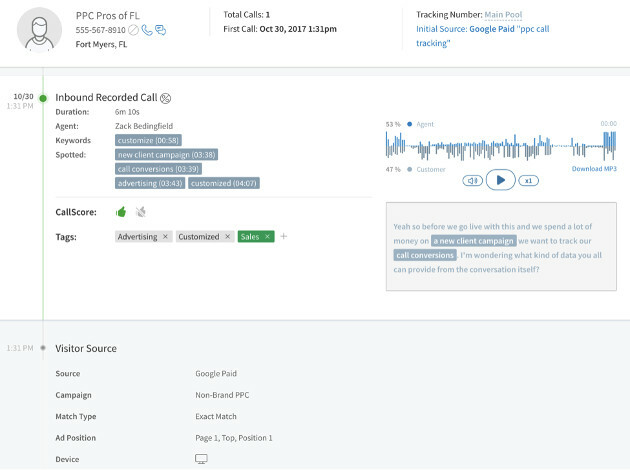 Call recording and keyword spotting allow for a deeper dive into these calls to answer more than just "is this a good lead?" You can mine the calls for potential customer pain points to train sales teams, shape your product's development or refine your bidding strategy based on the content of the call. Some of the biggest PPC wins I've seen come from finding new keywords to bid on based on how prospects inquire about your product and use different phrasing to describe their pain points. I highly recommend setting up some form of user experience software that goes beyond heat mapping. Using software like FullStory, you can go one step further than just remarketing to cart abandoners or using RLSA (remarketing lists for search ads; formerly, RFSA, or remarketing for search ads) to serve up search ads with deals on specific items. You can view a user's entire Web session recording, gain insight into how they experienced your website, and figure out what ultimately led them to purchase, call, submit a form, or abandon their cart. Even if viewing these cart abandoners' sessions doesn't result in some miraculous insight into how your website is poorly designed, that knowledge is still valuable: Now you know it's not a site design issue and you can focus your efforts elsewhere. As far as tying closed-won dollar figures to AdWords, you've got several options. The most basic form of tracking would be using static values from Google Analytics or in AdWords for each conversion type. Though you can even use dynamic values, it gets complicated for many types of businesses that don't have transactions happening online. One option is to pump touchpoint data for specific milestones along the customer journey to Google Sheets and add in revenue figures as they become available. The key here is choosing which touchpoints to track, how to weight milestones like first touch and lead capture, and tying all of that to a specific person/transaction that might happen offline. If you can get some unique identifier like email address or full name from your online efforts, you're in good shape to match that info down the funnel to a person/transaction. For this last category of attribution software, as you get more advanced, you'll eventually want to sync your CRM or back-office data to AdWords data via custom development or out-of-the-box software. A product like Bizible, for instance, gives you insight into the revenue generated from these campaigns and the multiple touchpoints that preceded a sale or purchase. As your campaigns and sales funnel become more complicated, understanding this data fully and taking advantage of it can make you a search marketing machine for your organization. So… will the AdWords automatons eat my PPC job? No. But they will change how you see your value as a search marketer. The takeaway here is that as Google's machine-learning algorithms take many of the repetitive tasks out of our roles, we can in turn improve PPC results for our business and clients by shifting our focus and putting our own automatons to work with software. This change isn't something to be afraid of, but is something to be aware of and curious about. The sooner we learn to work with our would-be machine overlords, the better it'll be for the beneficiaries of our work. That said, are all the automated bidding strategies perfect? No. Do they all work for every business or campaign? No. Which is why it remains important to track, test, iterate, and repeat. Until the machines can truly outsmart us, there's still lots of value in search marketing—but only if we adapt. Once they really can outsmart us... I'm sure there'll be much bigger things to worry about than our PPC jobs.